Shai Dego Hope is a cricketer of Barbadian origin who plays international cricket for the West Indies. He plays in the Tests and ODI format of the game. Born on 10 November 1993 in Barbados, Shai is a right-handed batsman and is also a wicket-keeper. Hope made his first class debut in the 2012-13 Season. The first two years went well for him, but he caught the eyes of the selectors after a magnificent season in 2014-15. He scored a staggering 628 runs in just nine matches and was the fourth highest run getter in the tournament. On the last day of the 2014-15 Regional four day competition, he scored a double century against Windwards Islands at the Kensington Oval that drew a lot of eyes towards him. Hope had played only 14 first class games before he made his international debut. After the double century against Windwards Islands, he was called for the national team. He made his Test debut against England at the Kensington Oval on May 1, 2015. The first match didn’t go well for him as all he could manage was a 5 and a 9 in the test match. However, nobody doubted his talent. Everybody had attached words like talent and potential with the name ‘Shai Hope’, but he couldn’t display any of it in the first few matches. He proved his talent against England in the second Test on 25 August 2017. He scored his maiden ton in the first and constructed a partnership of 246 runs. 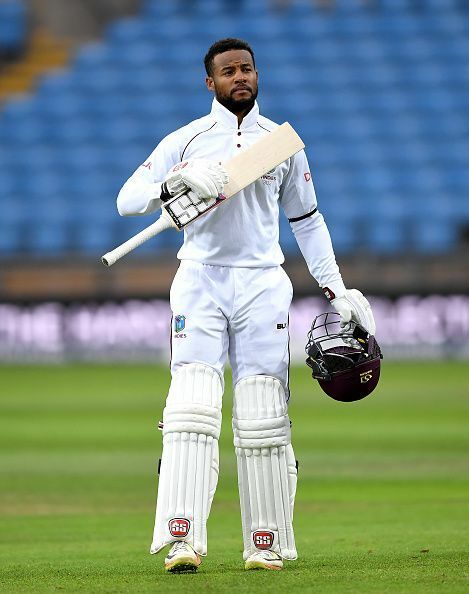 As the team was chasing a mammoth total of 322 in the second innings, he scored another hundred and added 144 runs with Kraigg Brathwaite and took the team to a 5 wicket win. It is very early in his career for one to point out a low patch. However, the first few Test matches of his career didn’t go well for him and he could only manage an average of 16. Hope plays for the Barbados Tridents in the CPL. He played an effective role for Barbados in 2017 as they went on to win the Regional Super50. He scored centuries in both the semi-final and the final and was also named the man of the match in both the games. When he scored two hundreds against England in a Test match at Headingley, he became the first player in 534 first-class matches to score a hundred in both the innings at Headingley. Because of his innings, West Indies became the first team to chase such a huge target at the stadium in 69 years.